Chris Samnee: We made it back!! 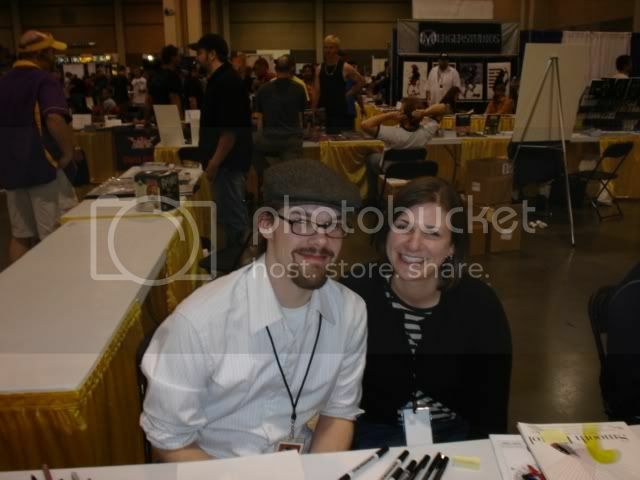 Here's Laura and me at our table in Indie Island (thanks for the pic,Shannon) at Heroes Con this past weekend. You can probably tell by our smiling faces that we had a great time, probably the best experience we've ever had a show. We got to see some of our "con friends", talk with fans, did a ton of sketches, not to mention the fact that I splurged on waaay too many quarter and dime comics. I'll ramble on more about the show as I post some of the sketches over the next couple of weeks, but in the meantime I just wanted to say thanks to Shelton Drum and Casey Jones for keeping this show going, Brian Hurtt, Cindy and Cullen Bunn for being such good company at the show and for being such great friends, and a big thanks to everyone who made it out for making my first Heroes Con everything I had hoped it'd be, and more. Oh, sure, it sounds like everyone had fun while I stayed home for Father's Day! Somehow I doubt mowing my lawn was as exciting, or even as productive for that matter. Happy belated Father's Day, Seth. Sorry you couldn't make it out. You planning on any cons this summer? Can't wait to see you at Mo-Kan this September. I wish I could got to alot more cons, but that is one I am going to try to attend on a yearly basis. All the best. I'm jealous, man! Cullen said you guys had a great time. The goatee's a good look on you. Hey Justin, at least you've got a show to go to. There's kids in Africa that have to go without comic conventions altogether. Hey Mike! Yeah, Heroes was a blast, maybe you can make it out next year. "Goatee"? That's supposed to be a beard, but only grows in the goatee-area.